Summary: Pulitzer Prize-winner Junot Díaz’s first book, Drown, established him as a major new writer with “the dispassionate eye of a journalist and the tongue of a poet” (Newsweek). His first novel, The Brief Wondrous Life of Oscar Wao, was named #1 Fiction Book of the Year” by Time magazine and spent more than 100 weeks on the New York Times bestseller list, establishing itself – with more than a million copies in print – as a modern classic. In addition to the Pulitzer, Díaz has won a host of major awards and prizes, including the National Book Critic’s Circle Award, the PEN/Malamud Award, the PEN/O. Henry Prize, the Dayton Literary Peace Prize, and the Anisfield-Wolf Award. 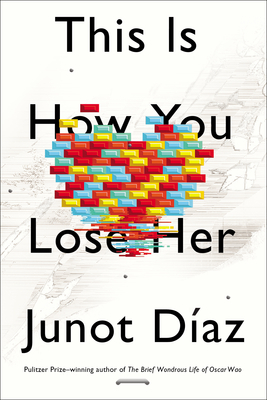 After hearing Junot Diaz speak at one of this year's BEA adult breakfasts, plus all of the pre pub talk from the folks at Penguin, I knew I wanted to read THIS IS HOW YOU LOSE HER. THIS IS HOW YOU LOSE HER is a collection of stories that primarily focus on Yunior, a Dominican immigrant who can't help but cheat on the various women in his life despite his best intentions. (I say "primarily" because all of the stories except one have Yunior as one of the main characters.) These stories aren't in chronological order -- rather, they jump all over major and minor events in Yunior's life; however, they all delve into the complexities of love and loss. When I first picked up THIS IS HOW YOU LOSE HER, I was afraid that I might not be able to relate to these stories. Frankly, I wasn't sure that I was all that interested in reading about a young Dominican man who was a serial cheater. I tend to want to like the main character in a book. In addition, I was concerned when I started finding the occasional Spanish phrase because I was afraid that I might be missing out on something important. I found that these phrases weren't really an issue for me, but I was worried all the same. What I did find, however, was that I was quickly drawn into these stories, especially the ones about Yunior's early years; and I actually discovered (much to my surprise) that I really liked Yunior. Despite his tendency to cheat, I didn't think Yunior was a terrible guy; and I'd even go so far as to say that he was just damaged and misunderstood... and very self-destructive! I'd be remiss in my review if I didn't mention just how amazing Mr. Diaz is as a writer and storyteller. I was truly blown away by how good he really is. Yes, the book was entertaining; and yes, Junior was a fascinating and well-developed character. However, what impressed me the most is just how astute Mr. Diaz was about universal emotions like love and loss. And how he managed to tackle these serious issues with snippets of humor. THIS IS HOW YOU LOSE HER was extremely complex and emotional, and I loved how much my assumptions about the story and the characters changed as I read more and more of this book. It takes a very powerful writer to be able to change my initial impressions/biases in such a way as this book did. As is the case when I read short story collections (not that I've read many! ), I tend to appreciate some stories more than others. In THIS IS HOW YOU LOSE HER, my favorite story was the one called "The Pura Principle" which detailed Yunior's older brother's battle and eventual loss with cancer. It was a beautiful and extremely touching story, and I think it's one of the main reasons that I began to feel more compassion towards Junior. I also enjoyed the story called "Miss Lora" which takes place during Yunior's teen years when he falls for an older woman as well as "Invierno" which gives a glimpse into Yunior's early years in the United States. Unfortunately, I haven't gotten around to reading Mr. Diaz's last book THE BRIEF WONDROUS LIFE OF OSCAR WAO (you know, the one that won the Pulitzer!) yet, but I have certainly added that novel to my must-read list after finishing THIS IS HOW YOU LOSE HER. There is absolutely no doubt that Mr. Diaz is an extremely skilled writer and I am looking forward to reading more of his exquisite prose. THIS IS HOW YOU LOSE HER is most definitely a book worth reading... even if you shy away from short story collections. It's a beautifully written book that also manages to address some common themes like love, loss, guilt, and self-destruction. I check out a copy of this book from my local library. I got this from Penguin on audio, and I'm anxious to listen to it. He was heralded as the hottest young writer when his first book came out (and I believe Yunior is in that one as well). I've heard that Yunior may be an autobiographical character? Glad to hear you liked this one. It goes on the long list (ever growing) of audios on the iPod. I didn't realize this is a short story collection. Hm, I have it on audio and I wonder if it will work for me that way. I'm on a kick of short fiction these days. I'll have to add this one to the list. I know I have to read this author also. And I am very impressed you liked the main character in spite of being a serial infidel!